I have been overwhelmed by the response my last kitchen post has receive! Wow!! Thank you so much for sharing your kind words and thoughts on my two-day project! It was definitely a labor of love, so to get so much blog-love is wonderful!! A lot of you have asked for more details about what I did and the colors I used, so I thought I’d give you all of the info on that. By far, the question asked the most has been whether the upper and lower cabinets are painted different shades of white. The simple answer is, yes, they are painted different shades of white. But, it looks far more obvious in the pictures than it does in person. 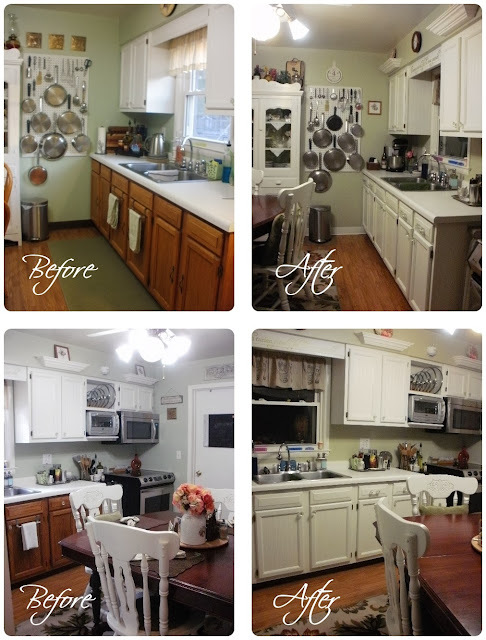 The upper cabinets were painted using Rustoleum Cabinet Transformations in Pure White. These were painted two years ago, and they have held up beautifully, I think mainly because of the Top Protective Coat that comes in the kit. FYI, this kit was also used on my dining chairs, and it has also held up even with the beating those chairs get every day. The lower cabinets were painted using Valspar Signature Paint + Primer in Pale Bloom 7002-8. I tried to match the uppers, but it was next to impossible, so I just went with the closest color I could find. I finished them off with Varathane polyurethane heavy use formula in a satin finish. Pale Bloom is just a tad more grey than the Pure White, but you cannot tell in person. In the pictures, I think it shows up more because of the light reflection. 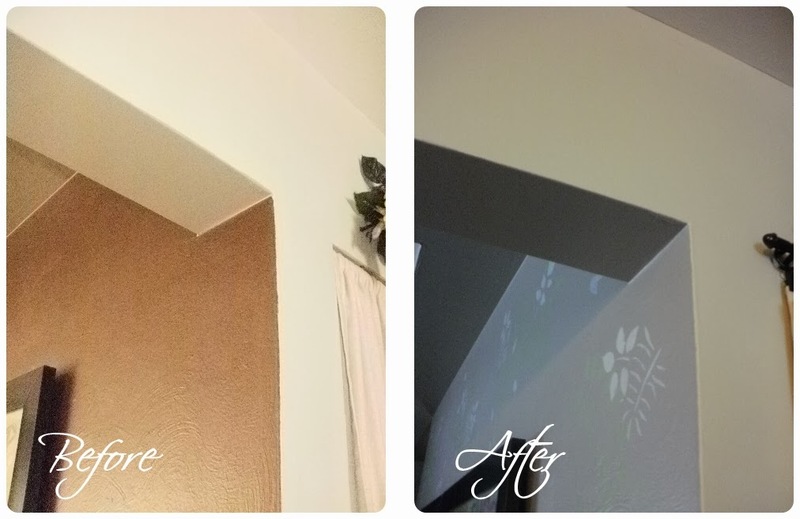 Pale Bloom was also used on the window trim, the door trim, and on the rubber baseboards. I did not use a separate primer on the base cabinet or drawer fronts but quickly found out that was a mistake. The paint wasn’t covering as well as I wanted, and I was having to use four coats to get the coverage that made me happy. So on the cabinet doors, I used Zinsser primer and the job went a lot faster. I had forgotten when I did the upper cabinets that I had applied the beadboard wallpaper before I did any painting. That might have been because I got wonderful coverage with the Rustoleum kit than I did with regular paint–two coats of the Rustoleum and I was done. The lower cabinets, I primed first and then applied the wallpaper. The results look the same, just a little different process. Corner of my kitchen you don’t often see. I wish there was a way to really show what a difference the paint color on the walls made to the overall look of the kitchen. Since the intensity of the new color compared to the old color is very much the same, photos really just can’t capture the difference. I’m not sure if these pictures really demonstrate the difference well or not. The dark brown accent wall was painted a few months ago the same color as the rest of the living room and stenciled, so it’s hard to see. But the old color in the kitchen was bluer, and now it is more grey. If you have any more questions, please feel free to email me or leave a comment! I’ll try to answer them all. PrevPreviousLook what happened in my Kitchen in TWO days!